It was as if every person in LA who wished they lived in New York was there. It was fantastic. What a community. All of the poetry lovers in LA in one place to see the Anne Carson. For Free. With cookies and coffee. She performed a new piece called, “Lecture on the History of Skywriting.” We did not know what to expect, nor did poet Stephen Yenser know how to introduce it. Previously performed in April at the Whitney Museum, it was a very new piece. Darkness, and then the click of her flashlight as she walked to center stage. The sound of silence and then another click. 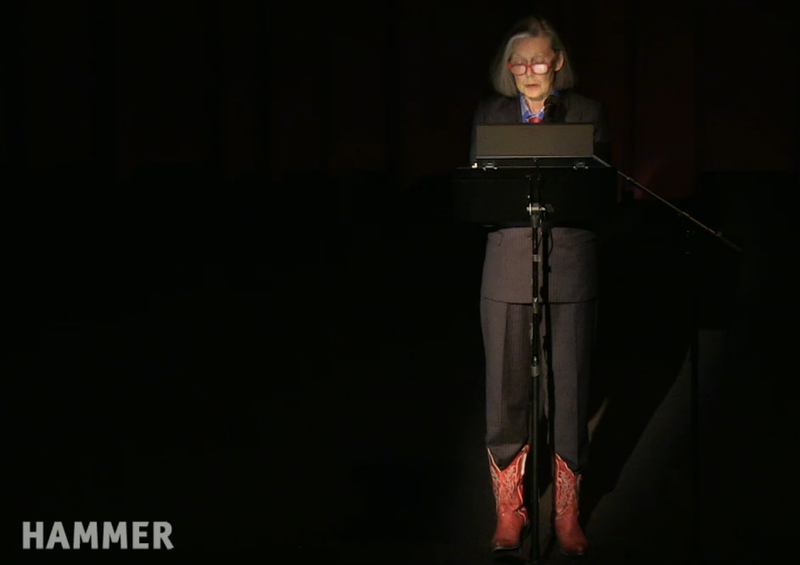 Anne Carson stood in an elegant suit, red glasses, and red cowboy boots. She started to read in a very calm and intellectual voice. “This is the history of my writing career up until now.” For a moment, I thought she was going to speak all about her long and celebrated career, being the one of two Canadians ever shortlisted for the National Book Prize, her MacArthur “genius” Award, her PhD in Classics. We were in LA after all. But no, she was not Anne Carson. She was the sky, and the sky was trying to make us understand its writing life. The piece was so smart and creative, interdisciplinary – she referenced from astronomy, meteorology, philosophy, literature, classics, politics and probably more I didn’t pick up on. Yet, it was funny. It was self-aware, critical of society and critical of herself. I felt transported. The intensity of the spotlight made me feel like we were floating around in Anne Carson’s mind. Boy, was it wonderfully weird. It was unlike any poetry reading I had ever been to, and yet, it was definitely poetry. Right? One of my favorite moments was when Carson interviewed Godot, especially the deleted section. Robert Currie, Carson’s partner, as the voice of Godot was splendid. His soft voice created a controversial Godot, not the forceful, oppressive presence I imagined in my own mind. The music and singing were incandescent. When the lights went up, all I could do was sit there. I felt everywhere at once, like the sky. 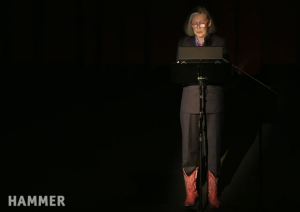 If you would like to watch the lecture, check out the Hammer Museum’s livestream.